These Streets, an unconventional rock music play, premiered in February 2013 at ACT, A Contemporary Theatre, Seattle. 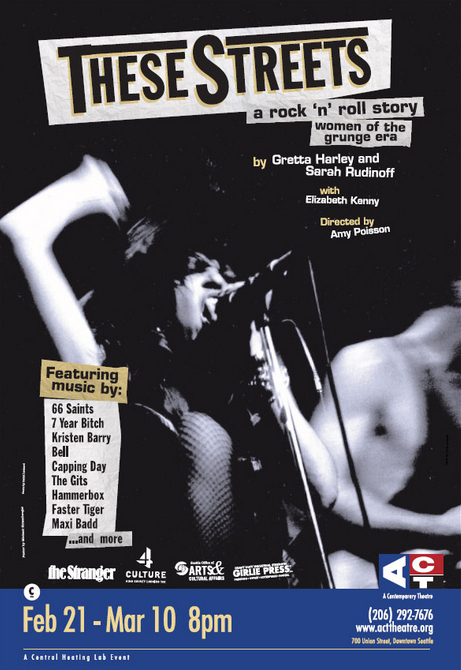 This theatrical piece and history project was inspired by women rock musicians in Seattle during the famed grunge years. Spearheaded by Gretta (playwright, producer, music director, composer, performer), Sarah Rudinoff (actor, writer, singer) and Elizabeth Kenny (actor, playwright), These Streets was inspired by over 40 interviews conducted with and about the many women rockers who were integral to the Seattle music scene during this legendary era. In addition to the theater piece, oral histories were filmed to be included in the library at the University of Washington. Concert versions of These Streets were performed at MEOWCon in Austin and Neumos at their 20th anniversary celebration. Find out more about These Streets.